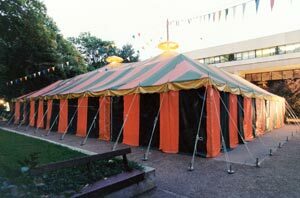 The first tent was a 55-foot, round, tangerine and green structure that seated an audience of about 200 people. The first season presented four shows in a stock format, and Tent took place over 10 weeks. The first two weeks of work included producing the tent and scenery, lighting, constructing costumes and rehearsing the first show. During the remaining eight weeks, each show was presented for two weekends at night, while work proceeded during the daytime on the show to follow. The first show in the tent was Neil Simon’s "Come Blow Your Horn" (which the tenters promptly christened "come blow your lines"). Audiences flocked to the tent in droves; many ladies in fancy summer dresses and men in sports coats and ties. Some patrons even brought picnic dinners to have on the grass outside the tent before the show. The tent was playing to full and sometimes overflowing audiences thanks to word of mouth, outstanding newspaper coverage and the excellence of the productions. So, the biggest problem Tent faced the first year was that the tent was too small. 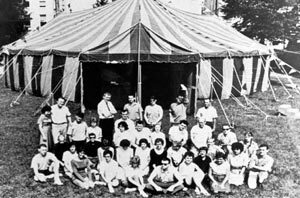 The second year, the problem of lack of space was solved with the addition of a 30-foot by 55-foot section in the middle of the tent that made it oblong, rather than circular, and brought the capacity to about 350 people. Yet, even with the addition, Tent continued to play to full crowds. From the second year moving forward, the basic formula for Tent was two musicals and two modern comedies. However, through the years, some comedy classics have been found in the repertory – Moliere’ s French comedy "The Miser," in 1963, and Shakespeare’s comedy, "The Merry Wives of Windsor" in 1964 were two such examples. Stock remained the form for the season until 1971 when repertory replaced it. It was reasoned that switching shows night after night was an excellent way for patrons who were on vacations to see all the shows, and also excellent training for the actors to learn to play different roles each night: an evil villain one night a singing waiter the next. The repertory form called for a very intensive period of building and rehearsal at the beginning of the summer with a new show opening every week for the first three weeks, and then alternating shows for a four-week period. With the repertory format, Tent presented three shows while stock included four most years. The repertory schedule has continued to be a popular one with tent audiences. In 1968 Craig Hall and the air-conditioned Coger Theatre were finished. When it was mentioned in 1966 that the tent might move indoors, tent theatre patrons gave overwhelming support for keeping the outdoor venue citing the ambiance as a major factor. As a result of the patron support of Tent, in 1969, a concrete tent pad was built next to Craig Hall and the 1969 tent was created. 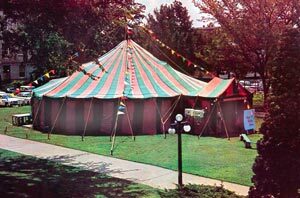 The 1969 tent is a rectangular 100-foot by 50-foot orange and green beauty with a dramatic end that allows seating to go higher on the audience side. This tent created better sight lines and increased seating to more than 400. In the summer of 2007, managing director Mark Templeton and Artistic Director Michael Casey met with Actors’ Equity in Chicago in the hope of transitioning Tent Theatre into a professional theatre company. Prior to the 2008 Season, Actors’ Equity and Tent Theatre engaged in an agreement to operate under a special letter of agreement referencing the University/Residence Theatre Association contract. It was the first time that Equity allowed such a special letter of agreement. The first production under this special agreement was "Cyrano de Bergerac." 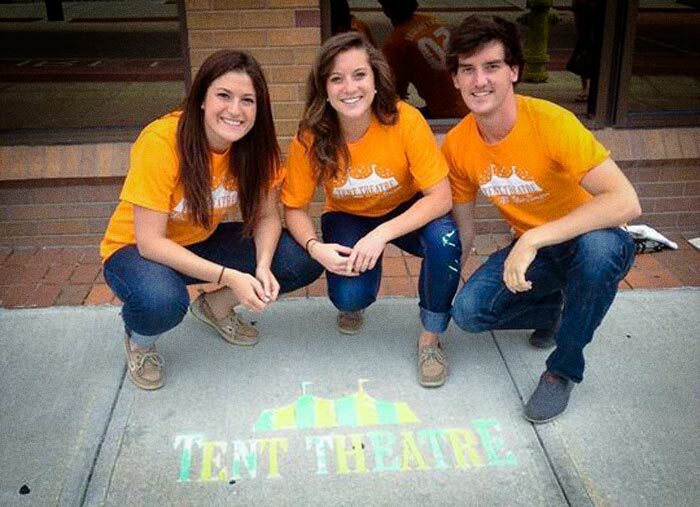 Tent Theatre now operates under a full U/RTA agreement that allows collegiate stars to work side-by-side with theatre professionals from around the country. These professional performers and technicians have quickly become mentors for students and provide major industry connections for students’ entry into the professional marketplace.